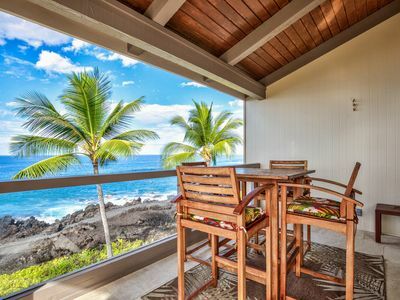 Just one of the wonderful experiences you came to Hawaii for.... an outstanding oceanfront condo to make your stay complete. 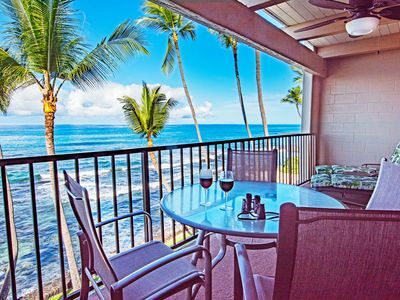 Our fresh one bedroom unit is on the second floor of the D building of the Wonderful Kona Reef Resort, really only six steps up! 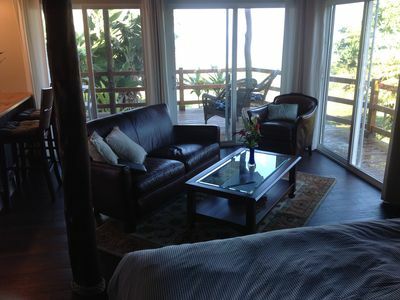 (Unit D14) From the time you enter our condo you will be drawn to the ocean view in front of you. 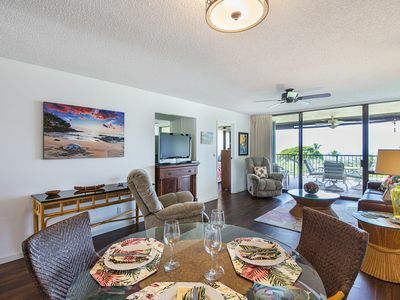 Our unit is fully appointed and air conditioned to ensure your stay is completely comfortable, from the swivel chairs on the lanai for watching the turtles or surfers play, to the extra comfortable pillow top king size bed. 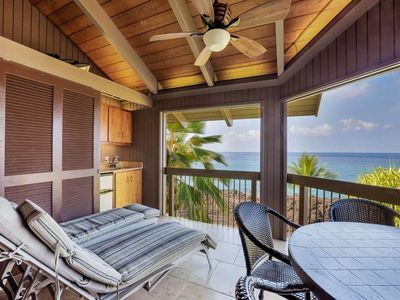 This condo offers the best in relaxation of the resort complex. 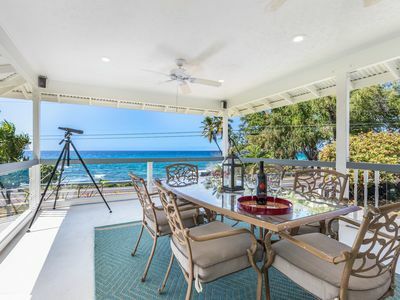 You have the best view from your own private lanai of the ocean and shoreline, where you are not too high to not enjoy the action of the waves crashing on the rocks, but high enough to have your own privacy. 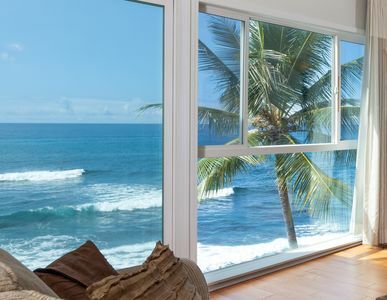 Once you open the sliding glass doors to the ocean, you may never close them again until you leave, as the sound of the ocean is so wonderful and is so peaceful, it will lull to sleep every night. 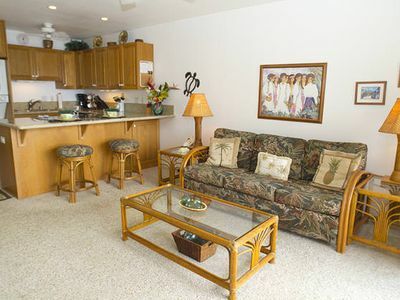 In the condo you will find all the needed items for a full relaxing stay. There is a comfortable full cushioned sofa that folds out to a queen size bed, a wonderful club chair for watching the view or reading. In July 2013 we added Granite counters and a new Stove in the Kitchen, Plantation Shutters in the Bedroom, New Carpet in the Living and Bedroom room along with new Drapes in the Living room! 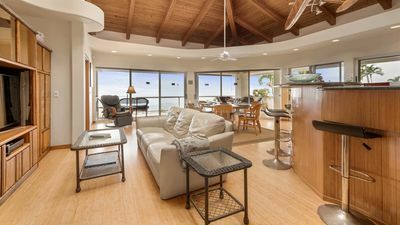 There is Air Conditioning in the condo for those rare extra hot days along with ceiling fans to keep the air moving, if the ocean breeze is not enough. 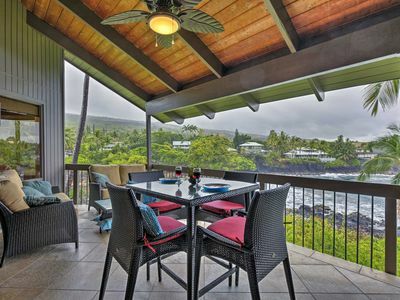 There is one ceiling fan in the living room, one in the bedroom and one more on the Lanai. 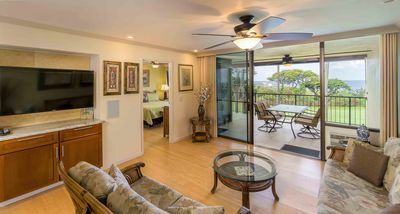 The condo has free password protected wireless internet access in the unit for web surfing, checking your email if you wish, or working if you have to (call the condo the “far west coast office”). The free phone service includes access to long distance to all of the US and Canada. 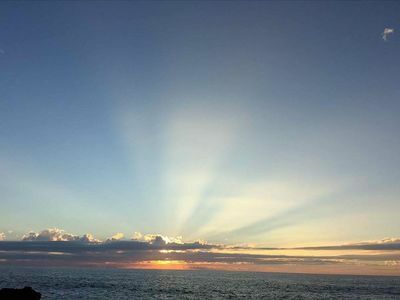 For those that can pull their eyes from the ocean there is a new 40” LCD TV in the living room with Cable access and a VCR/DVD player attached and in the bedroom there is another new 27” LED flat screen with Cable access. 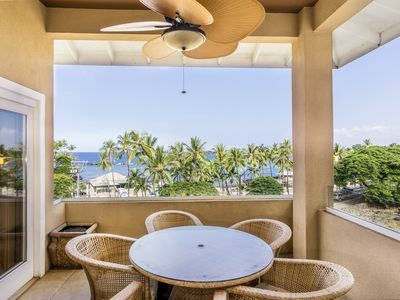 The Kona Reef Resort is an outstanding resort property with a great location, from the incredible oceanfront location to the sand beach next door, Honl Beach. 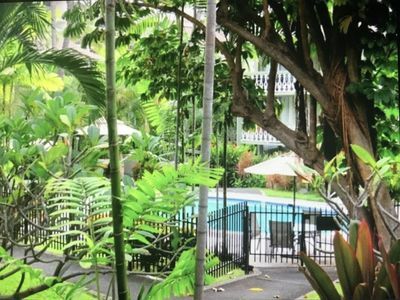 The resort has a wonderful pool and a large whirlpool spa. 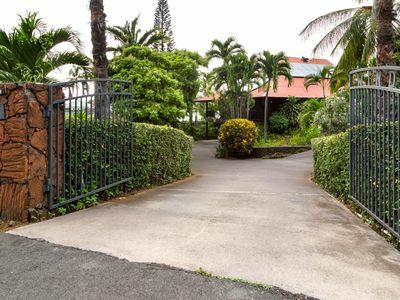 The Pool area also has tables with chairs and chase lounges for sunbathing and a Cabana party area with 4 large stainless steel gas BBQ’s for the guests to use. The BBQ area is a great place to meet other guests and share about the great experiences of each other’s adventures of the day. Parking is free and you can use the underground garage to keep your car cooler. 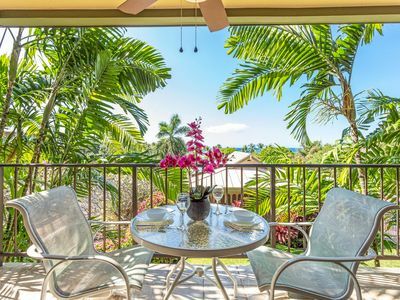 Our condo is an easy short walk to the shops, art galleries, restaurants and bars of the Kona Village area, which makes it easy as you don’t have to drive your car (and pay for parking) or walk back up the hill on Alii drive (be sure to take the lower back road to avoid the hill!). 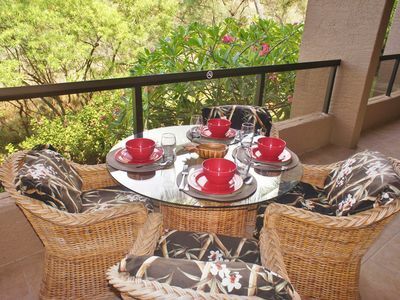 You may even find yourself not using your car for days as the Condo and area keeps you there and relaxed. 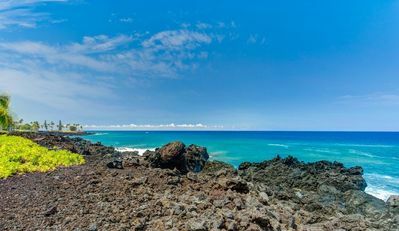 Our cancellation policy is if cancelled more than 90 days in advance in the High season or more than 60 days in advance in the low season 95% refund. Otherwise refund for the condo will only be made if it is re-rented for your time. Elegant White Sands Estate. 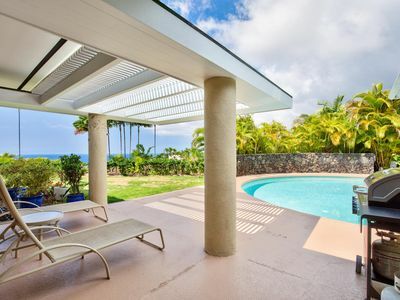 Ocean Views, Pool, Tropical Grounds. 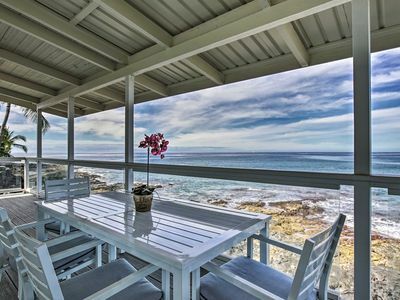 Oceanfront setting at Magic Sands Beach! 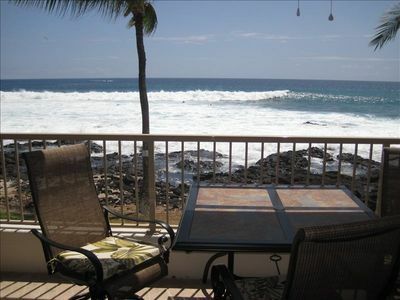 Oceanfront Kailua-Kona Condo w/Resort Amenities!